Hello there! Hope you are having a great evening! 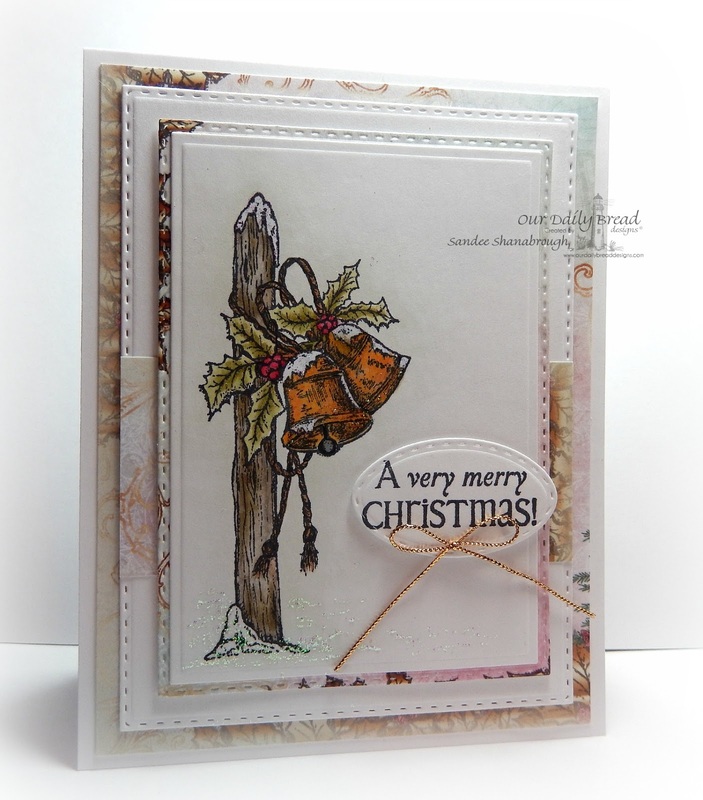 I made this card this afternoon for the Merry Monday Christmas Challenge this week to use bells. 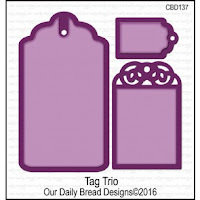 This set is called Jingle Bells and is from Our Daily Bread designs. I colored with copics. I used several ODBD dies: Rectangles, Double Stitched Rectangles, and Stitched Ovals. 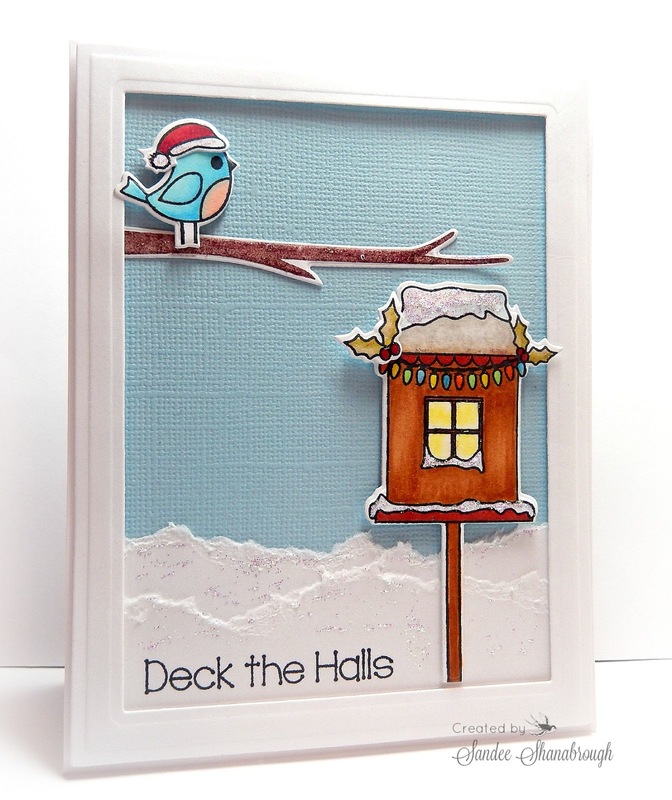 The designer paper is from the ODBD Christmas 2014 Paper Collection. I added stickles to the image for sparkle and a tiny gold bow to complete the card! 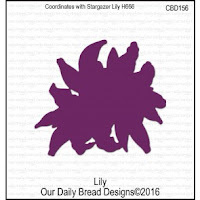 February release from Our Daily Bread designs! This card features Many Thanks, along with the new Boho Egg die, the new Happy Easter die, and both of the new Paper Collections. I used the leftover pieces from a card I made previously. I masked off part of the sentiment. And the little stars are negative pieces from the largest cross. Good morning! Such an exciting day!!! this week I am the guest designer at the Merry Monday Christmas Challenge Blog!!! 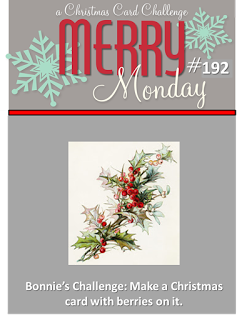 Thank you Bonnie and the Merry Monday team for letting me guest with y'all this week! is to create a Christmas card with berries on it. I decided to use this cute little set by Paper Sweeties that I purchased recently at the Heirloom Festival. Such a cute set of stamps and dies and I had fun with them! I made a frame for my little scene with Spellbinders A2 dies. 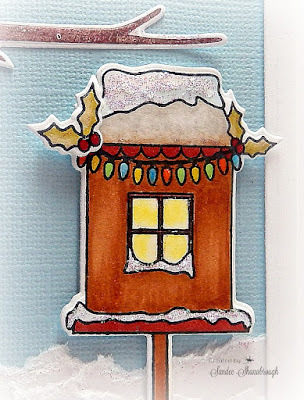 I tore white card stock to create the snow and added stickles for sparkle. The berries and the string of Christmas lights have a coat of Diamond Glaze too. 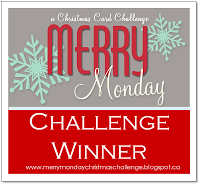 Merry Monday Christmas Challenge Blog! Thanks for visiting with me today! See you again soon! Mid-Month Release of Dies from ODBD! that will be a great addition to your collection! 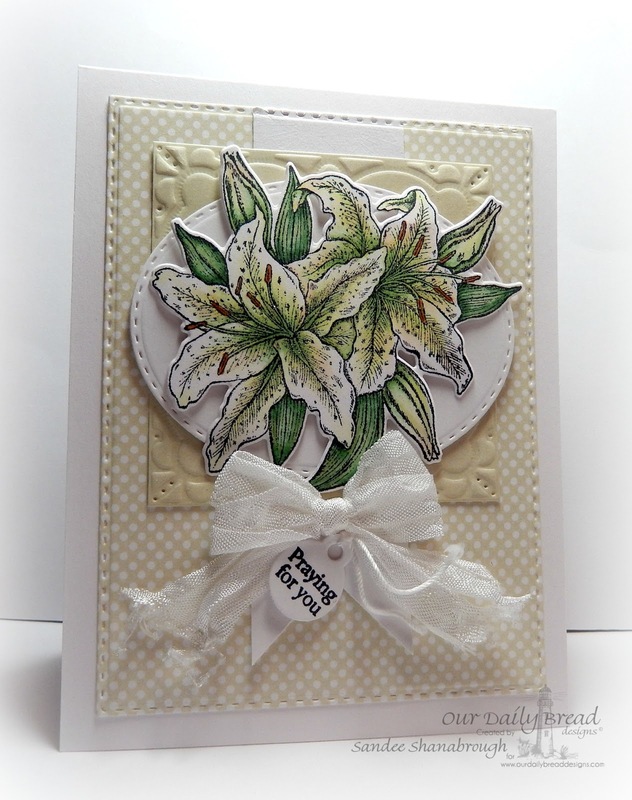 I can't tell you how many times I cut this beautiful lily out! I am so thankful to have a die for it now! The lily is from the set called Beauty. I used the sketch from this month's ODBDSLC for my layout. I cut the V in the long banner with the same die (Layered Lacey Squares) that cut the square panel behind the oval. The sentiment is from Mini Tag Sentiments and is cut out with a Mini Tag die. I also used Stitched Ovals and Double Stitched Rectangles. I added little touches of stickles to the petals to complete this card. 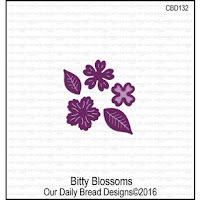 This card features the February releases: With Much Thanks, Easter Egg Dies, Easter Card Paper Collection, and Pastel Paper Collection, along with two of the new sets of dies released today: Bitty Blossoms and Tags Trio! 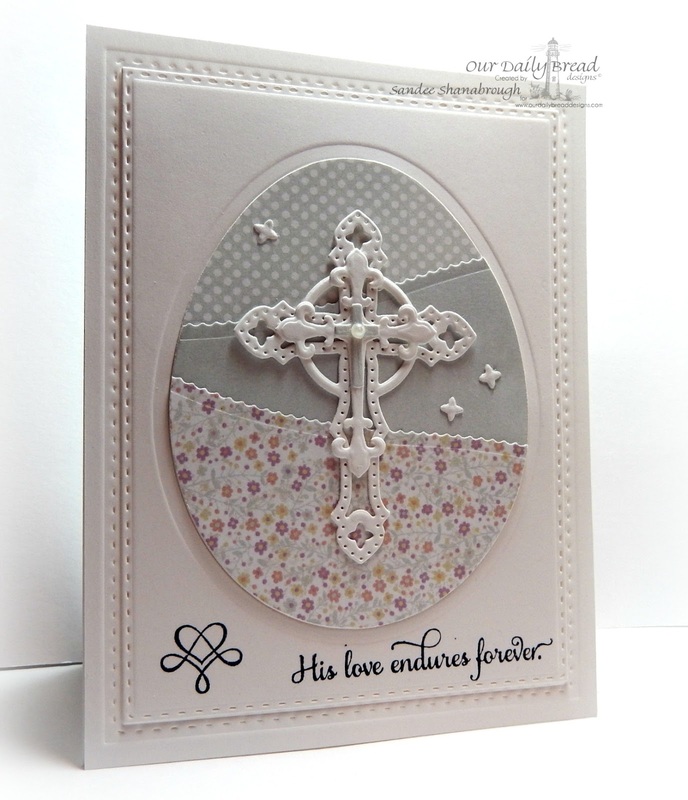 I also used the following dies: Birds and Nest, Ornamental Crosses, Lovely Leaves, Pretty Posies, and Double Stitched Rectangles. I colored the flowers and leaves with Pan Pastels. 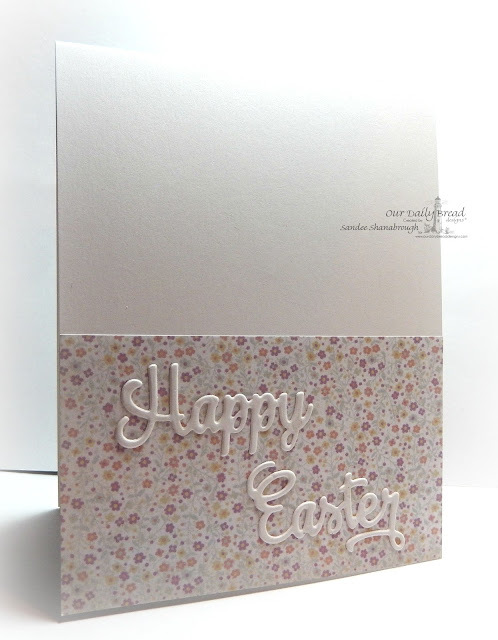 Tiny pearls and a small pink bow on the tag completes this card! Merry Monday challenge this week to do the Chalkboard Technique. I have never actually done the chalkboard technique! Can you believe it? And I really like how this turned out! I used this great stamp from ODBD called In The Highest. 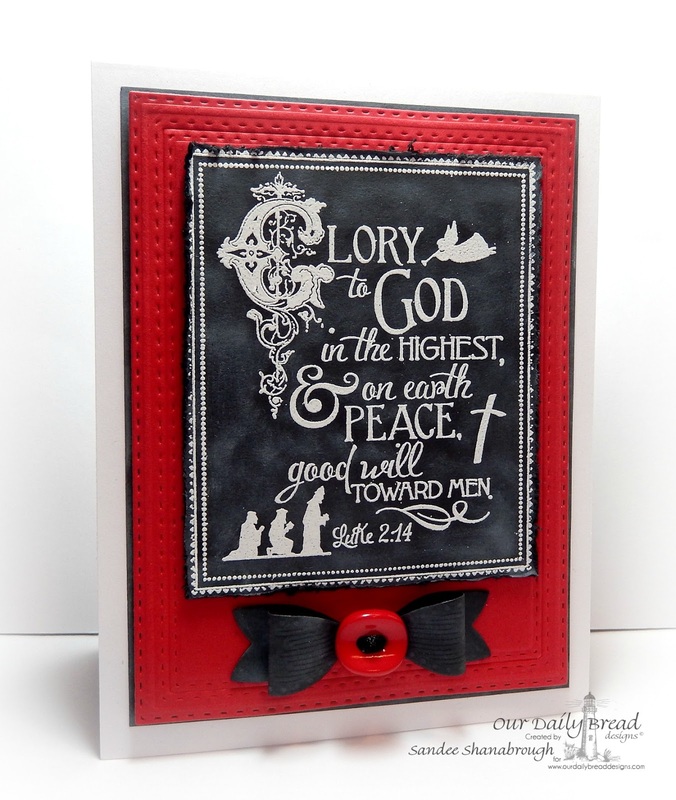 I stamped it in white ink onto black card stock and then heat embossed it in white. I trimmed around the image and distressed the edges. 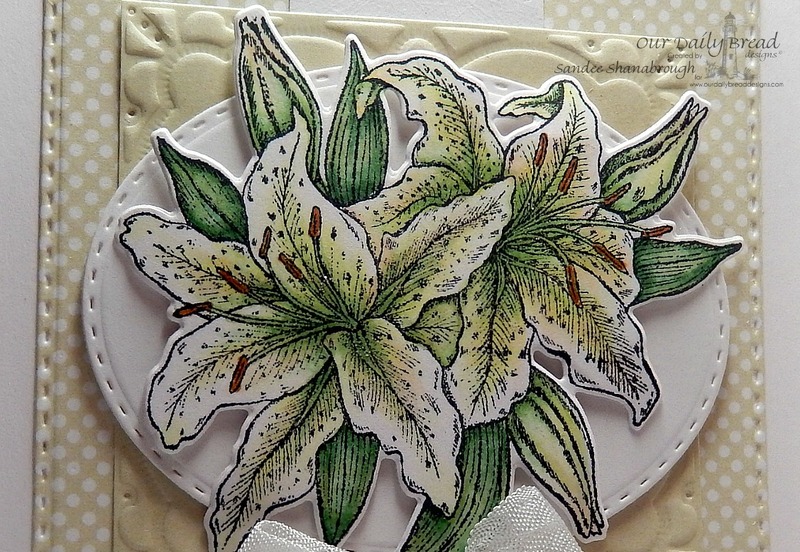 I used white ink to lightly sponge around the image to mimic chalk. 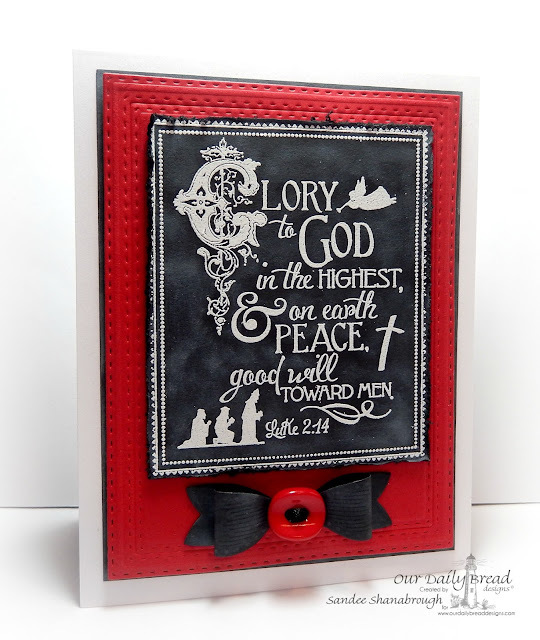 I also used white ink on the edges of the bottom black layer and on the ODBD Small Bow die cut. The red panel is cut and embossed with ODBD Double Stitched Rectangles. I added a red button to the bow to complete the card. 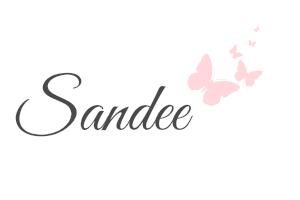 Thanks so much for visiting with me again this afternoon!